Six straight wins, undefeated in 16 games when scoring the first goal, ten straight games allowing 2 or less goals, when the odds are stacked against you like a Jenga tower built by a 4-year old, things are going to come crashing down. In a game deciding the top rank in both the Atlantic Division and the Eastern Conference, the Canadiens did everything they were supposed to avoid. Not the first time the defence isn’t on point but unlike other games in the past, Carey Price was having a tough night. On a couple of goals he looked at the rafters and those are a tell-tale sign that the person in net is more akin to Carey Price, Costco Gold member, than Carey Price, Olympic Gold winner. However the fault of Carey Price, it is not. The Habs weren’t off to a great start but were able to contain the Bolts’ momentum and got a goal of their own. As if they intended a re-enactment of the Canada – Russia Gold medal game at the WJC, the Canadiens slipped in the second period but this time, it cost them the game. Tampa Bay’s scorers were kept in check in the third and the Montreal club spent most of the period in the offensive zone, leaving their net empty for the last 3 minutes but still only managed to score one goal out of the three they needed to tie the game. This goes to show just how tight they need to play against the Lightning. Again, the defensive corps’ bad penalties cost the Canadiens. The worst penalty was taken by P.K. Subban, poking Brett Connolly from the bench like an old man poking a kid off his lawn with a cane. What’s absurd is that Andrei Markov instigated the whole situation. Connolly was hurt off a blocked shot and was limping to the bench. Markov collided with him trying to cause a bad line change for the Lightning and maybe get a too many men call. Instead P.K. sled down the bench to give his two cents, and the Bolts got a powerplay. Tampa Bay’s offence is first in the league with 134 goals, 10th in the league with 27 power play goals, and the Canadiens have kept their opponents to two goals or less in their last 10, and have the fifth best penalty killing unit in the league with an 86.46% efficiency. It was the unstoppable force meeting the unmovable object, and the unmovable object was sent flying. The Lightning’s first powerplay unit consisted of their second line of Ondrej Palat – Tyler Johnson – Nikita Kucherov. All 3 point-per-game players in their last 10 games. The Habs have one PPG player in their last 10 games and that’s Max Pacioretty. The Bolts have 3 on the same line. Sure enough, two powerplay opportunities were given to Tampa and two powerplay goals were scored. It’s in these emotional, hard-fought, high-stakes games that you truly see character come out. The way players respond says a lot about who they are and what kind of leadership they bring to the club. P.K. Subban put his club in trouble in the second, Max Pacioretty scored in the third and tried to rally the team for a better effort. P.K. Subban is an elite defenceman in the National Hockey League, no doubt about it. Where doubts lie are his leadership qualities. P.K. has the most minor penalties on his team. He is a fiery competitor and his passion is great when he’s pissed off and rips a shot from the point for a game tying goal. The same fiery passion is a detriment to the club when he takes an unnecessary penalty and gives up a powerplay or worse, a 5v3. Unfortunately for him and his team he does the latter way more. The worrisome aspect of his game is that now that he is the Habs number one defenceman, he doesn’t have a partner that can keep up with him. Markov and Gonchar are too old to play 25 minutes or more per game, and Beaulieu too inexperienced. Emelin and Gilbert have no business getting over 18 minutes of ice time per game, so it’s Subban’s responsibility to make someone in that group better. Before thinking about being team captain, he should be captain of the defencemen. It’s great when the team is beating New Jersey and Carolina on the road but when the club keeps taking it on the chin at home from teams like Chicago, Anaheim, and Tampa Bay, there’s a problem. A problem that will have to be fixed before the playoffs. 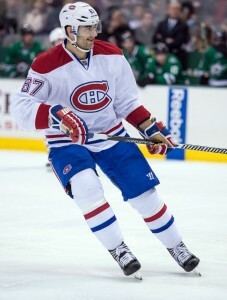 On the other side of the coin, Max Pacioretty is playing a big part in Galchenyuk’s development as a centreman. At the beginning of the season, he made it clear that he would like to see David Desharnais shoot more and not being relied on as the go-to goal scorer. The line was eventually broken up after their overpassing spoiled many scoring chances. Now on a line with Alex Galchenyuk and Brendan Gallagher, Pacioretty dishes out passes as much as he shoots, so much that his points are almost an even split, 17G and 15A. Max Pacioretty is smart you see, he knows a streaky goal scorer such as himself will get picked on by the media during a drought but a steady point producer will likely be left alone. Regardless of the motive, number 67 is making his teammates better. Not only the players on his line but demoting David Desharnais on the second line’s left-wing has been a blessing in disguise for the diminutive forward. Desharnais has 6 points in his last 10 games and puck possession numbers have him just a hair short of a three-way tie for first on the club at 51.7% CF behind Subban and Galchenyuk’s 51.8%. Nearly at the season’s halfway point, with 40 games under their belt. The Montreal Canadiens have shown good things and bad things. They’ve shown they can win on the road and win against elite teams, but they have also shown that they are brittle and it doesn’t take much to break their momentum. Often, they break it themselves. Good news is that the Habs are a young team with a lot of growing left to do. They have already grown and are better than they were October 8th, hopefully they will be better than they are now come April 11th. They will have to be if they want to be seen as a legitimate contender for the Stanley Cup. Something they are not at the moment.